Although you might think that standup paddleboard yoga can only be practiced on the water, the new trend of indoor SUP yoga is making it possible for yogis to stay on top of their boards all year round. Many gyms and yoga studios have begun offering indoor SUP yoga: standup paddleboard yoga classes that use a board instead of a mat. Not just any paddleboard is used, however; for these classes, you’ll need the Indo Yoga Board, created a little over a year ago by surfer Hunter Joslin. The six-foot-long board features four rockers on the bottom, allowing people in the yoga studio to experience the same instability they would on the water—and to get the same core workout. Even more instability can be added by placing three inflatable cushions under the board. Elle Magazine reports that Joslin developed the first Indo Balance Board in 1975; the Yoga Board is the eighth version of the original board, and it’s already taking off in popularity. 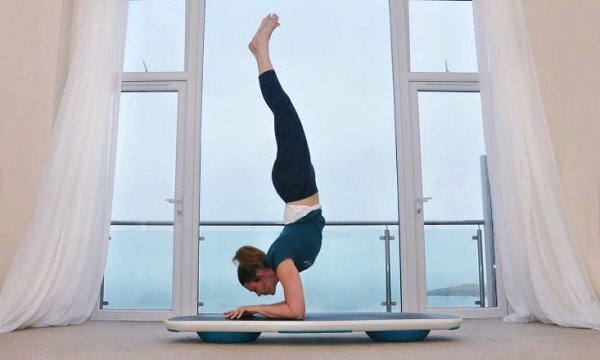 However, it's not just the Indo Balance Yoga Board that's being used in indoor SUP yoga classes. Some also use the Ocean Yoga Board and other boards that "float" on a cushion of air to simulate the instability of a paddleboard. SUP yoga enthusiasts are eagerly adopting this new method of performing watersports indoors. According to Yoga Journal, at least 125 locations in the U.S. and Canada are already offering indoor SUP yoga classes, with another 85 planning to offer them next year. By practicing yoga on an unstable surface, yogis train a lot of the muscles they don’t normally use in a regular yoga class. In addition to strengthening the core (which must remain engaged at all times on a SUP board in order to not fall over), different muscles are constantly called upon as your balance shifts along with your poses. Simply put, yogis would need to work harder to stay balanced—not to mention, refine their technique when doing even simple poses. Perhaps indoor SUP yoga doesn’t offer quite the same calming, scenic environment as SUP yoga on the water (or the same soft landing if you fall off your board), but it certainly provides many of the same workout benefits. What do you think — would you try indoor SUP classes or do you prefer to keep your paddleboard in the water?